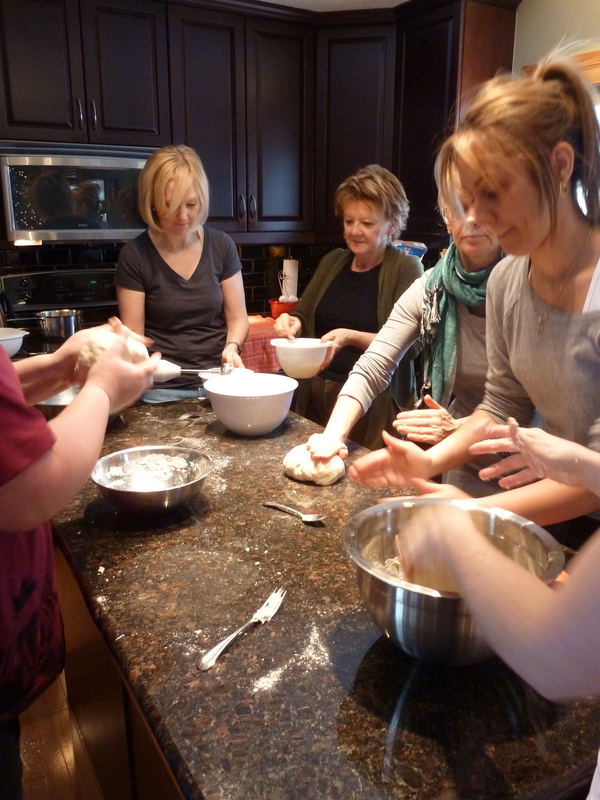 Learning from our Mothers – Perogies! 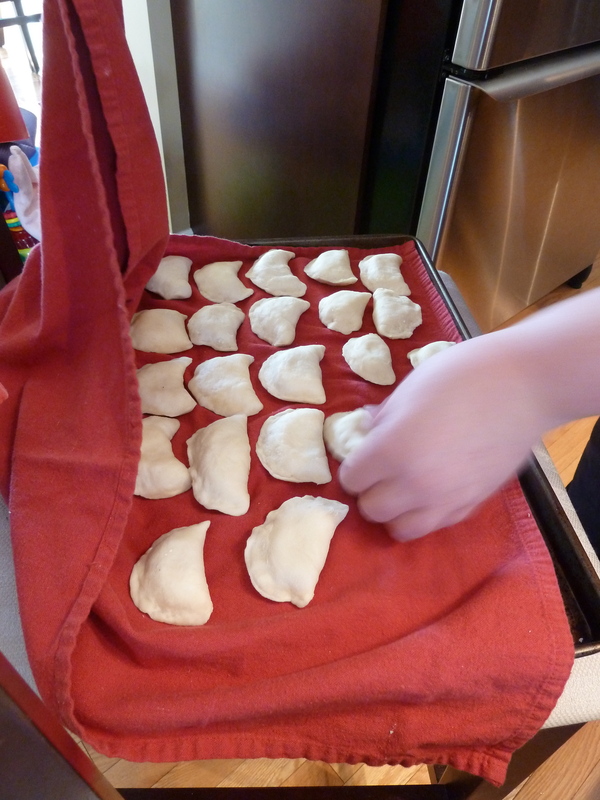 Cousin Carlee came up with the brilliant idea that we learn how to make perogies from scratch from our Moms. I could never read it, too myopic. But it was above my Baba’s sink as long as I’ve known her. The memory is just the shape and placement. 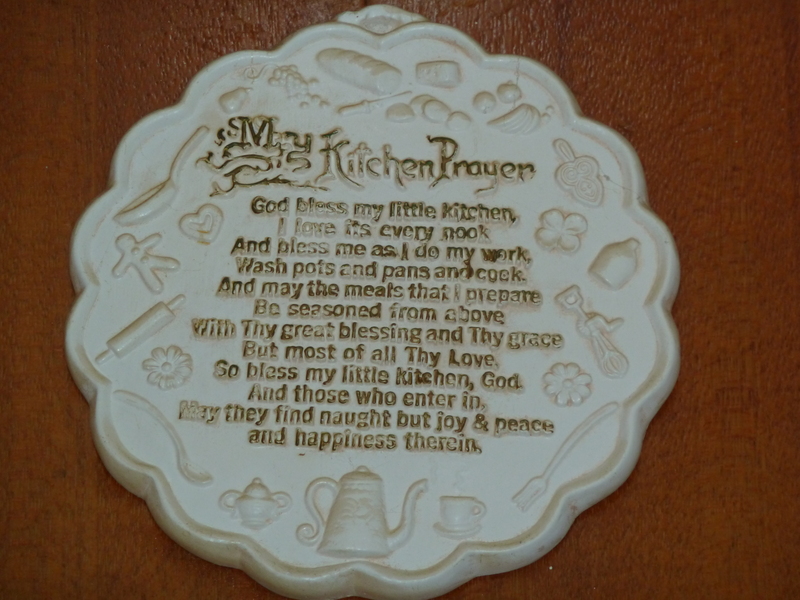 But reading the prayer today seems poignant and pertinent to the memory of my Baba. 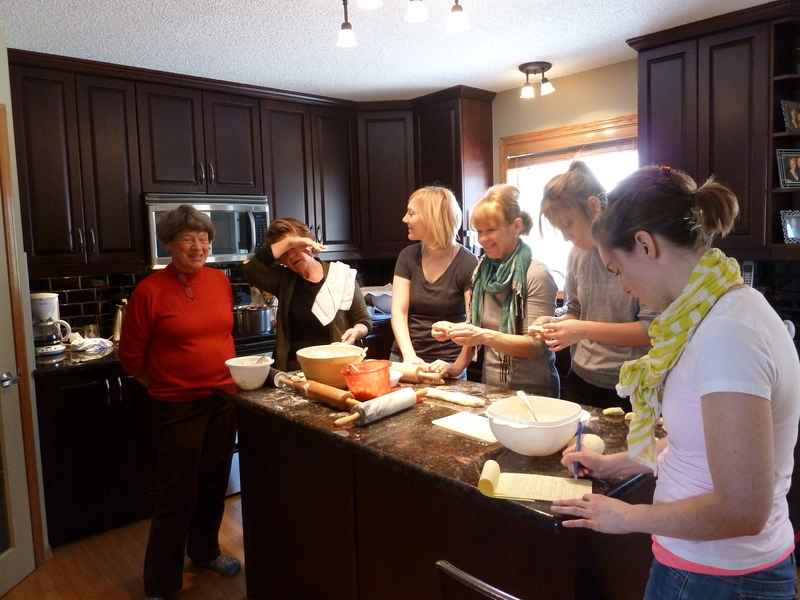 Some of us have helped our Mom’s with the stuff and pinch part of the perogy making process. One brave soul who writes a food blog, attempted to make perogies from scratch on her own with mixed results, and others either have their Mom make perogies for them, or have successfully scoured the city for the best store-bought variety (the Italian Centre Shop seems to have the best at a reasonable price). I think we finally turned a corner since the frugality of World War II. 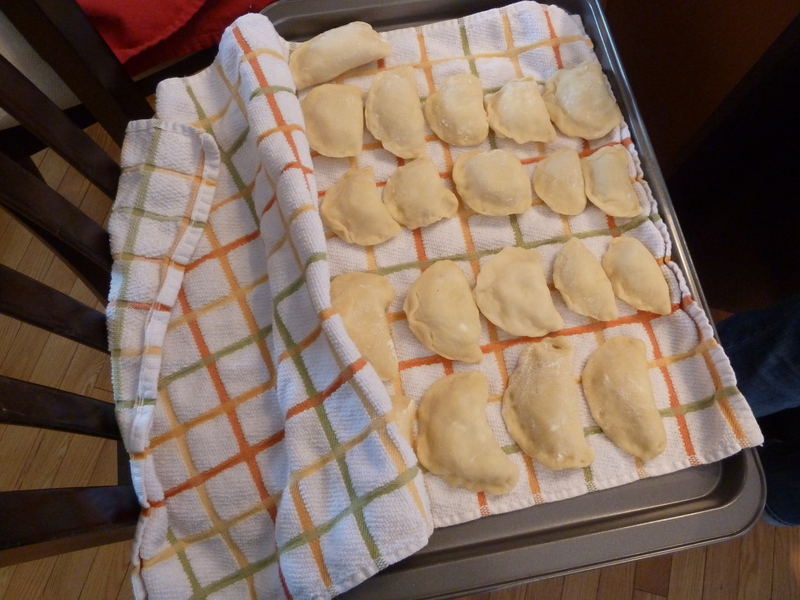 If you mentioned “buying” perogies at one time in our family, you risked exile, scorn and a lot of tsk tsk tsks. Today, we discussed “buying” perogies, and not one single tsk. Carlee has one of those homes with a dreamy granite island kitchen, and it was her idea, so we gathered at her place today. We were instructed to bring a rolling pin, large mixing bowl, tray and tea-towel. She provided the ingredients, we provided the enthusiasm and labour. Most of us seem to have memories of the process taking days. My memory, back in Baba-days, is that the batches were huge and the process seemed to take an entire weekend. 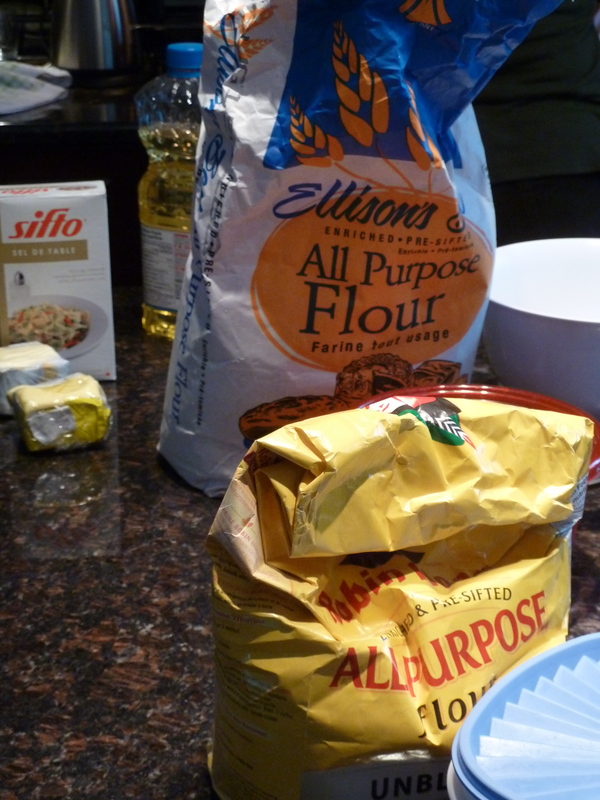 Sacks of flour and potatoes would be in the kitchen. The Palm Dairy’s sign was in the front window, and we’d plead for the milk-man’s entire supply of dry-curd cottage cheese. While our Moms made dough and filling, my cousins and I were exiled to play in the street, or the basement where we would explore Uncle Ed’s bedroom which provided us with an education that no school was about to teach us. Back in the day, as the perogies were boiling on the stove, my cousins and I were given about 43 cents to buy a large container of sour cream and 2% cottage cheese from the corner store run by the Chinese people across the street. If we were well behaved, we were given empty ginger ale bottles to return and could buy candy with the refund. 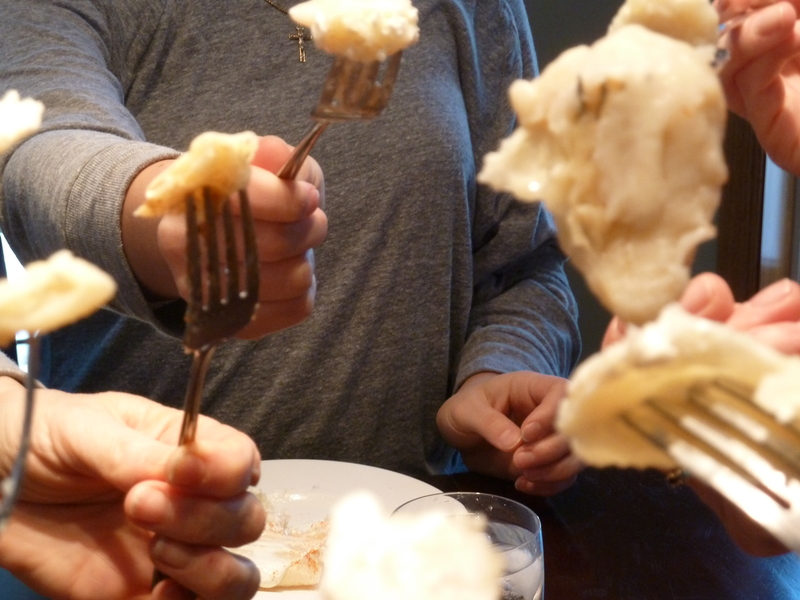 Bacon and onion was fried, perogies boiled and when they boiled and floated for several minutes, drained and tossed with butter, the adults seated themselves in the dining room, and us kids at the ubiquitous kids table in the kitchen. Those were great times. The filling is not documented, as it’s one of those “instinctive things” our mothers vary each and every time they make it. We grew up with exposure to a single filling: potato and cottage cheese. Rare occasions would expose us to sauerkraut. If you had perogies at someone else’s house, you might even try the exotic “dessert” perogy filled with blueberries or plums. Today we had potato sauerkraut, potato-cottage cheese, and potato-cottage cheese and onion. Then the conversation sort of blurred. The type of potato doesn’t seem to matter, but one Auntie suggested big baking potatoes are better because it’s less peeling, to another Auntie suggesting Yukon Gold is best, just because they are great all round potato. Yukon Gold’s received the most nods of approval. The conversation then started to discuss how jalapeno cheddar cheese perogies would be delicious, and it was here, I had to close down my hearing. Cheemo (TM) can do it, sure. But I am stubborn enough that I will not allow jalapeno peppers or pizza flavours infiltrate my family tradition. We had a riot making our dough. We are a competitive bunch, so we had to compare by poking each others dough. We chatted and laughed and worried about the method. 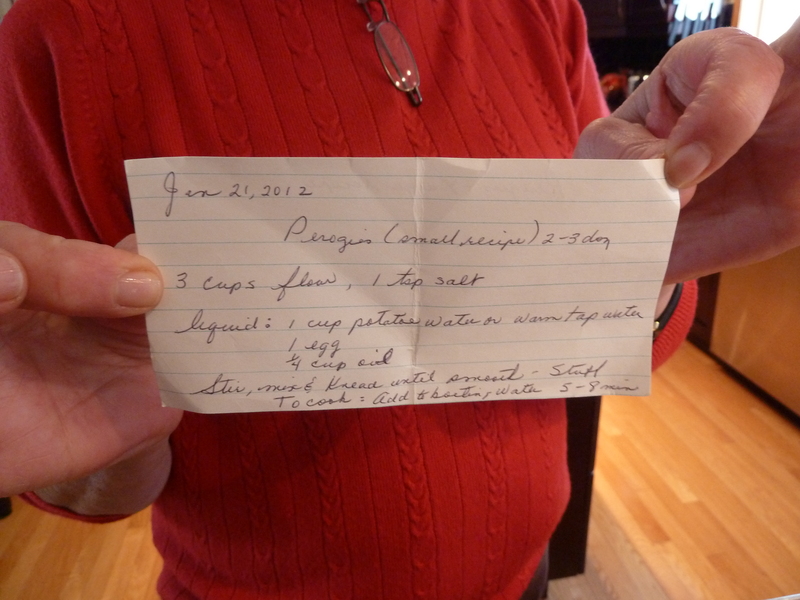 One cousin-in-law pleaded complete exhaustion after mixing the dough. 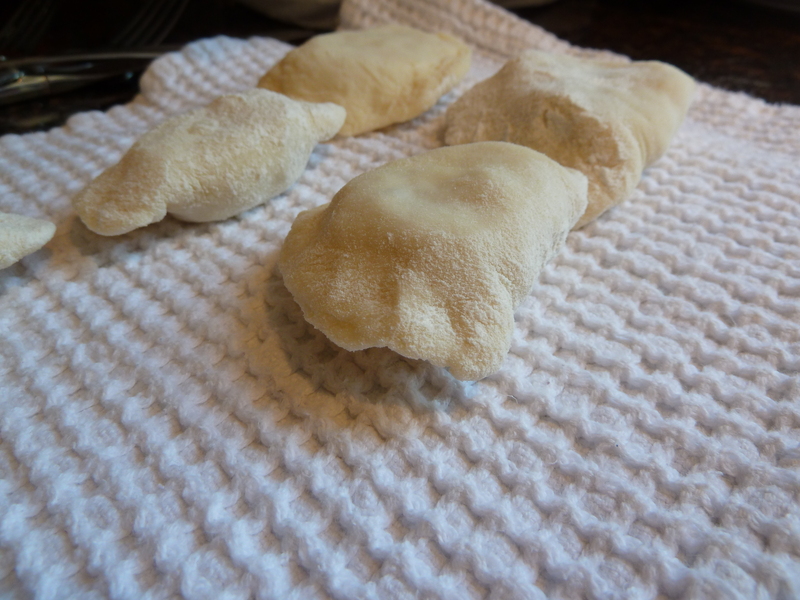 Another cousin thought they could manage if they could fill just three perogies each day. 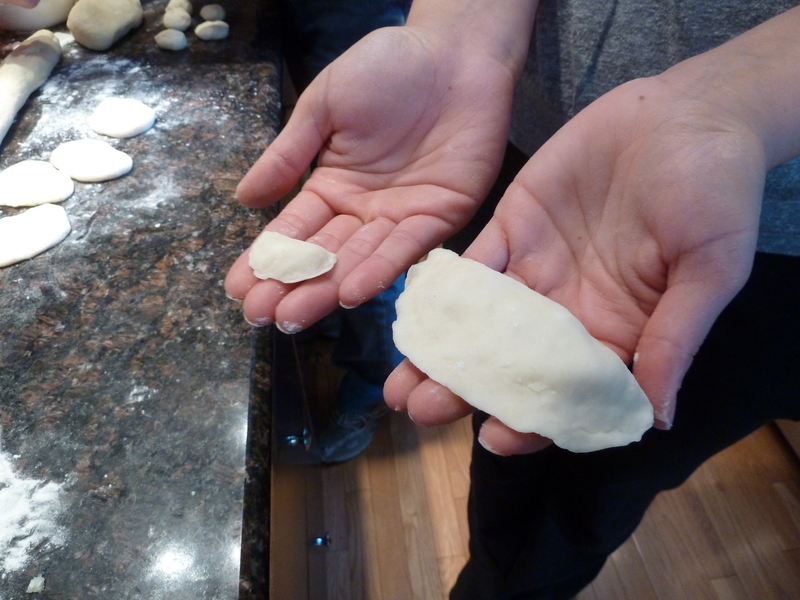 One cousin invented the “diet” perogy, and the mythological “big” perogy that our Baba threatened to make, but never did. 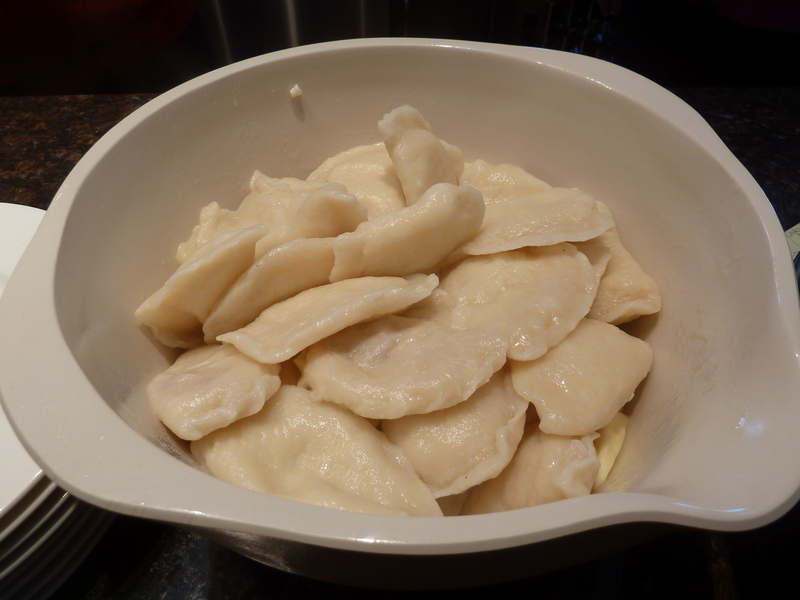 Each one of us had to sacrifice five perogies to the pot, so we could have a light lunch and taste our efforts. The rest we could take home and share as we saw fit. 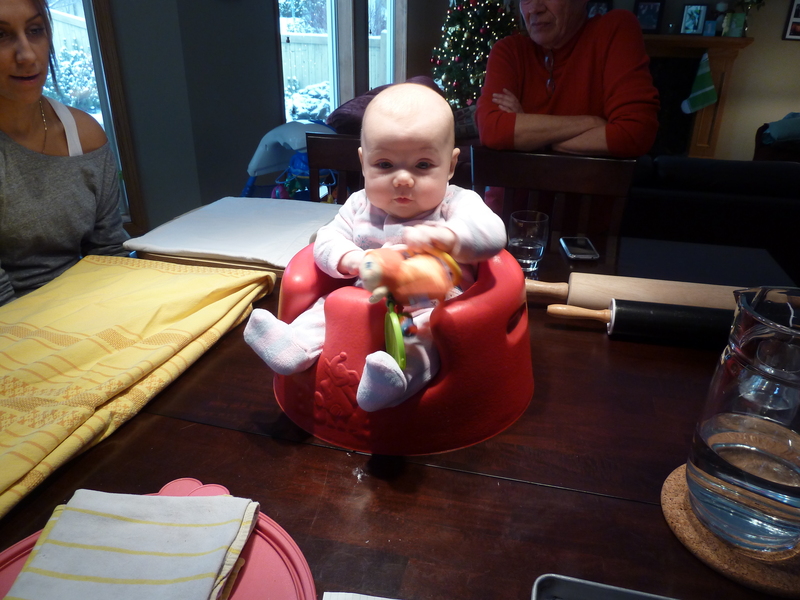 We were thrilled with our results and discussed our next project: cabbage rolls.